BOOTIE LA – Pirates vs. Zombies! Los Angeles BOOTIE LA – Pirates vs. Zombies! Bootie celebrates two of our favorite characters -- it’s Pirates vs. Zombies! Chose a side and dress up! $100 prizes for Best Zombie and Best Pirate costumes! Only $5 before 10 PM! Choose a side and dress up! $100 prizes for Best Zombie and Best Pirate costumes! Halloween may have been last month, but Bootie LA never needs an excuse to play dress up! This week we celebrate two of our favorite characters — it’s Pirates vs. Zombies! 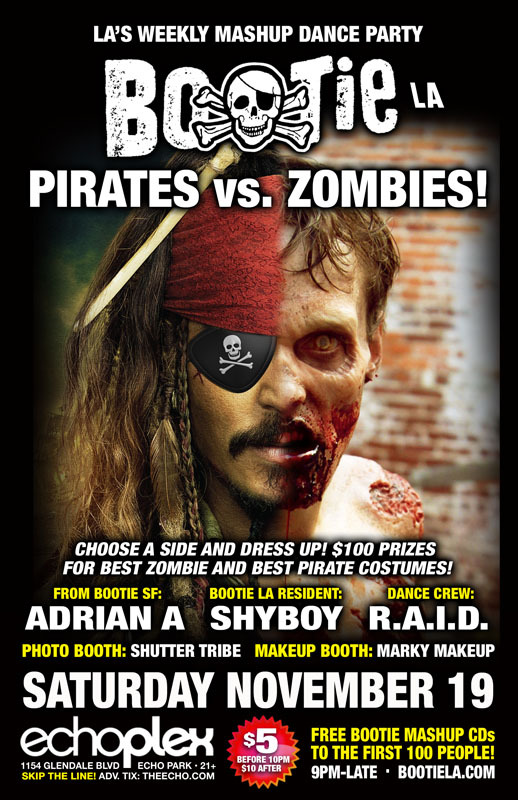 Choose a side and dress up — there are $100 prizes for Best Zombie and Best Pirate costumes! Adrian A comes down from Bootie SF to join resident DJ ShyBoy as they spin a treasure chest of the best mashup bootie in the world, while resident dance crew R.A.I.D. (Random Acts of Irreverent Dance) throws brainy go-go insanity and Marky Makeup gives you undead makeovers you’ll treasure! Plus Shutter Tribe captures all the fun! All this, plus FREE Bootie mashup CDs for the first 100 people through the door!